The N-terminal decapeptide of alpha-smooth muscle actin. In IF, this antibody gave a positive signal in SV40LT-SMC cells. This antibody reacts with smooth muscle cells of blood vessels and parenchymal tissue of intestine, testis and ovary. This antibody strongly crossreacts with alphasmooth muscle actin in a variety of mammalian and non-mammalian species. The antibody is conjugated with FITC at a ratio 6 Moles of Fluorescein to 1 Mole of antibody. Maximum excitation of FITC occurs at wavelength 492 nm, and maximum emission occurs at wavelenght 520 nm. Our Abpromise guarantee covers the use of ab8211 in the following tested applications. IHC-P 1/50 - 1/75. (as well as on cell smears). WB Use at an assay dependent concentration. PubMed: 17237513Use at an assay dependent dilution (from Pubmed:17237513). ab8211 staining alpha smooth muscle Actin in SV40LT-SMC cells. The cells were fixed with 100% methanol (5 min), permeabilized with 0.1% Triton X-100 for 5 minutes and then blocked with 1% BSA/10% normal goat serum/0.3M glycine in 0.1% PBS-Tween for 1h. 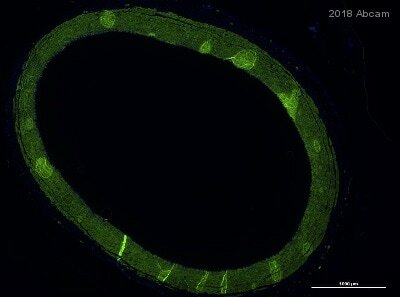 The cells were then incubated overnight at +4°C with ab8211 at a 1/100 dilution (shown in green) and ab195889, Mouse monoclonal to alpha Tubulin (Alexa Fluor® 594), at a 1/250 dilution (shown in red). Nuclear DNA was labelled with DAPI (shown in blue).